Pilsbry, H.A. 1910. Unionidae of the Panuco River system, Mexico. 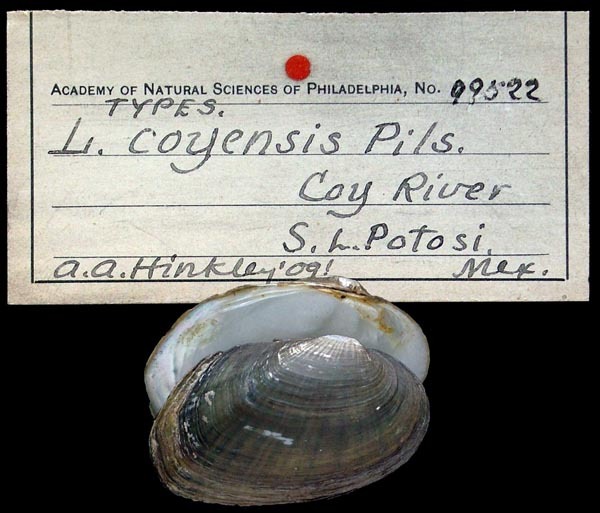 Proceedings of the Academy of Natural Sciences of Philadelphia 61: 532-539. 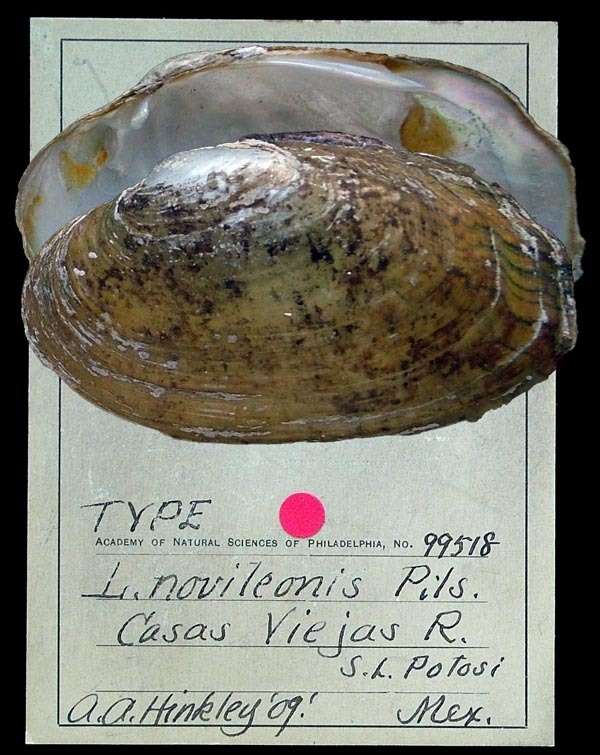 Frierson, 1907, Nautilus: pl. 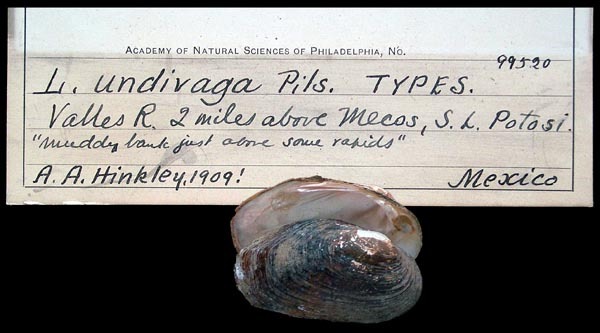 12, two lower right figs..
Pilsbry & Frierson, 1908, Nautilus: 81. Pilsbry, 1910, Proc. Acad. Nat. Sci. : 534. Type(s): HOLOTYPE ANSP_93810, Tampico, Mex. Pilsbry, 1910, Proc. Acad. Nat. Sci. : 534, pl. 25, figs. 1-4. Type(s): LECTOTYPE ANSP_99517 (selected by Johnson & Baker, 1973), Moctezuma R., Mex. Pilsbry, 1910, Proc. Acad. Nat. Sci. : 537, pl. 27, figs. 1-2. 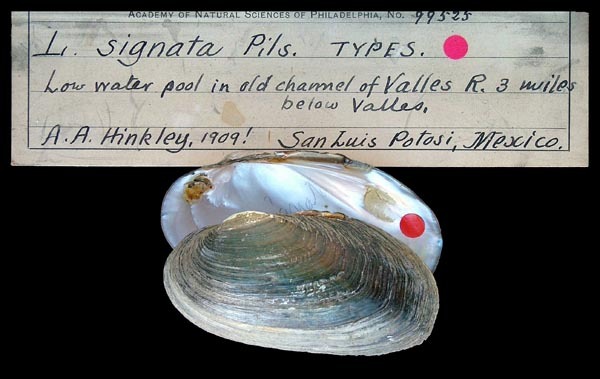 Type(s): HOLOTYPE ANSP_99518, Casa Viejas, T., S.L. Potosi, Mex. Pilsbry, 1910, Proc. Acad. Nat. Sci. : 534, pl. 26, figs. 7-9. 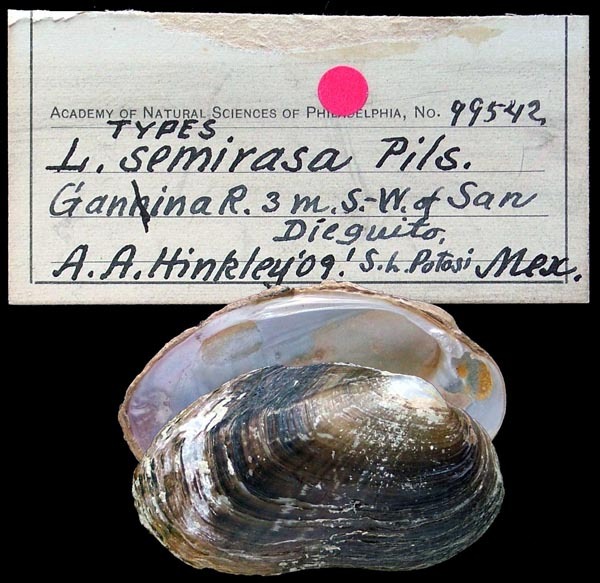 Type(s): LECTOTYPE ANSP_99542, Ganina R., 3 mi SW San Dieguito, S.L. Potosi, Mex. Pilsbry, 1910, Proc. Acad. Nat. Sci. : 536, pl. 25, figs. 5-6. Type(s): SYNTYPE ANSP_99525, Valles R, 3 miles below Valles, San Luis Potosi, Mexico. Pilsbry, 1910, Proc. Acad. Nat. Sci. : 536, pl. 26, figs. 1-4. Type(s): LECTOTYPE ANSP_99520, Valles R., 2 mi above Mecos, S.L. Potosi, Mexico. Lampsilis metallica ganina Pilsbry, 1910. Pilsbry, 1910, Proc. Acad. Nat. Sci. : 539, pl. 27, fig. 6. 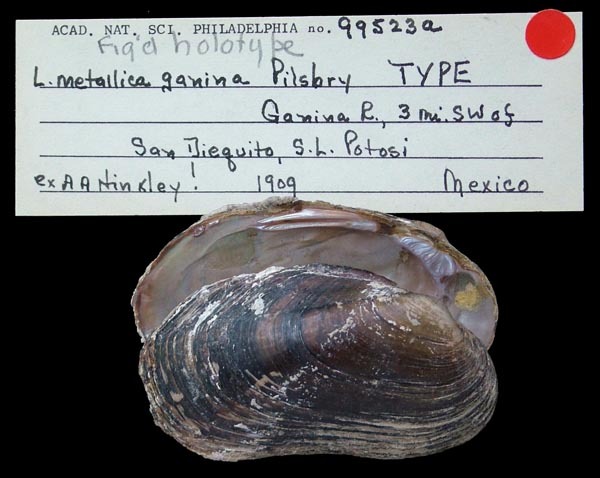 Type(s): SYNTYPE ANSP_99523A, Ganina River, 3 mi SW San Dieguito, Mexico. ‘von dem Busch’ Of Authors. Pilsbry, 1910, Proc. Acad. Nat. Sci. : 533. Simpson, 1914, Descr. Cat. Naiades: 603. Frierson, 1927, Check List N. Amer. Naiades: 82. Glabaris cylindracea (Lea). — Pilsbry (1910: 539). Glabaris strebeli (Lea). — Pilsbry (1910: 539). Lampsilis aztecorum (Phil.). — Pilsbry (1910: 533). Lampsilis coyensis n. sp. — Pilsbry (1910: 538). Lampsilis discus (Lea). — Pilsbry (1910: 533). Lampsilis fimbriata Frierson. — Pilsbry (1910: 533). 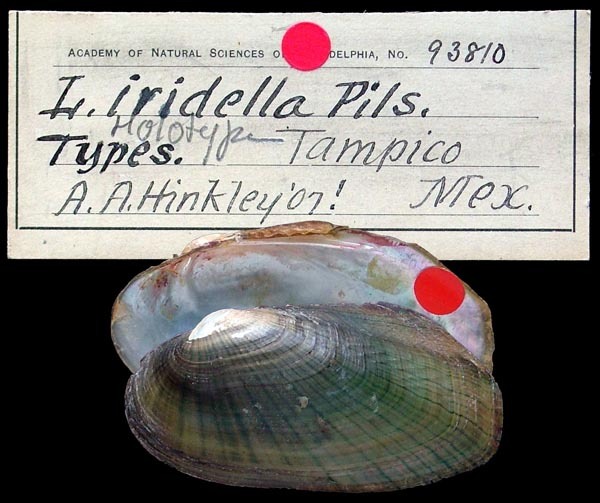 Lampsilis iridella Pilsbry & Frierson, 1907. — Pilsbry (1910: 534). Lampsilis metallica ganina n. subsp. — Pilsbry (1910: 539). 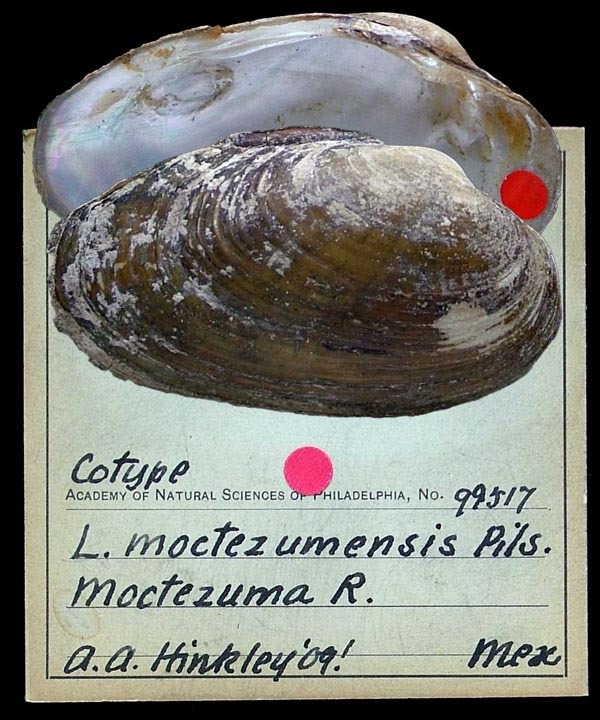 Lampsilis moctezumensis n. sp. — Pilsbry (1910: 534). Lampsilis novileonis n. sp. — Pilsbry (1910: 537). Lampsilis popei (Lea). — Pilsbry (1910: 535). Lampsilis semirasa n. sp. — Pilsbry (1910: 534). Lampsilis signata n. sp. — Pilsbry (1910: 536). Lampsilis strebeli (Lea). — Pilsbry (1910: 533). Lampsilis tampicoensis (Lea). — Pilsbry (1910: 534). Lampsilis undivaga n. sp. — Pilsbry (1910: 536). Quadrula nickliniana (Lea). — Pilsbry (1910: 532). Quadrula semigranosa (v. d. Busch). — Pilsbry (1910: 532). Unio corium Sowb. — Pilsbry (1910: 532).